Going home for a visit while living abroad is an interesting experience. It’s as if you are seeing a place you have known all your life with the fresh eyes of a tourist, and it can bring to the fore changes – either for better or for worse! I have visited South Africa once or twice a year since I moved to London in 2002 and one of the things that floors (and concerns) me when I go home these days is the astonishing increase in the price of supermarket food. Even if you convert to foreign currency, food produced locally in South Africa is no cheaper than food imported into the UK from all over the world, which makes no sense to me at all. But, conversely, eating out in South Africa is relatively far cheaper that in the UK – especially at the top end of the dining scale. Anybody have any theories?? Anyhow, one of the restaurants that constantly makes it onto the Top 10 list in the South African Restaurant Awards is La Colombe on Constantia Uitsig wine estate. By South African standards, it is expensive but having peeked at a sample menu online, I realised that by UK standards it was a positive bargain and so the decision wether to reserve a table was really easy. 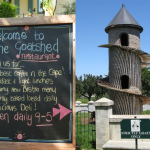 Although it is situated on a wine estate, the restaurant is in suburban Cape Town, so it’s perfectly possible to go for dinner as we did if you are based in Cape Town. British-born chef Luke Dale-Roberts trained at the Hotel Baur Au Lac in Zurich before working at a number of excellent restaurants in the Far East. He took over as executive chef at La Colombe in November 2006 and has made his mark on the menu with the addition of Asian-inspired touches. Under his capable leadership, the restaurant was voted Best Restaurant in the Middle-East and Africa in 2006 in the San Pellegrino World’s 50 Best Restaurants rankings and has reappeared in the top 50 at least twice since then. The setting is stylish but informal, as is the friendly and attentive service. There is a dining room but I had specifically requested a table on the terrace which was definitely the right place to take in the welcome evening breeze, the twinkly candles and the sound of the little fountain. The menu is concise but tempting and special dishes of the day are listed on a chalkboard, while the wine list is approximately the size of a telephone directory. Gordon Ramsay would be proud. After a chat to the helpful sommelier, we decided on a Klein Constantia Rhine Riesling. While we perused the menu we tucked into the heavenly warm olive foccacia and a complimentary platter of vegetable crudites served with little carafes of oil and vinegar from Willow Creek (one of the sponsors of the South African Food Blogger Indaba in Cape Town next Sunday!). Having chosen our food, we were treated to an amuse bouche of chicken liver parfait with apple chutney on a crouton, drizzled with truffled vinegar – a lovely balance of flavours and textures. I started with a warm salad of tiger prawns on a sourdough crouton and roasted aubergine, together with tempura mussels, garlic crisps and a warm orange butter sauce. This not only looked beautiful on the plate, but the flavours were just heavenly. The sourdough and aubergine provided an earthy note while the delicate seafood was perfectly complemented by the citrussy sauce. A definite highlight! My main course was listed as canard du jour (or duck of the day) and turned out to be a pressed deboned confit duck plus a duck breast on a cardamom and fig reduction, with slivers of green beans, fig & foie gras chutney, and a truffle spring roll. Simple food it isn’t – there was a lot going on on my plate – but I loved the combination. The sweet reduction was the perfect partner for the perfectly pink duck breast (and why isn’t serving cardamom compulsory with duck?? ), and the chutney was perfect with the salty confit. Elsewhere, my companions had the loin of springbok with a cherry reduction, and grilled linefish served like a piece of Joan Miro art. For dessert I had a fondant of chocolate on a biscuit base topped with a chocolate lattice, and a scoop of sublime cherry ice cream on a brandy snap. Again, I love the contrasts between the sweet chocolate and tart ice cream, and the soft fondant and crispy biscuit base. I also could not resist my neighbour’s dessert which consisted of a vanilla creme brulee served with a berry compote and homemade shortbread. Attention to detail is a fine thing when it comes to desserts, and La Colombe definitely scores top parks for this. We finished with coffee and decidedly moreish petit fours consisting of mini meringues, cocoa-dusted chocolate truffles and little cubes of Turkish delight, each distinctive and delicious. The meal came to roughly R450 per person with wine and service (this was in 2008). Yes it’s a lot of money but no, not if you are paying in Pounds (which we all were). In fact, you would pay a great deal more for comparable food and service almost anywhere in Europe, proving once again my theory that if are after affordable modern European fine dining, South Africa offers unparalleled opportunities to sample wonderful food at unbeatable prices. The meal we had would not in any aspect have been out of place if you’d eaten it at a high-end restaurant in London or Paris. The service was professional and charming throughout the meal (and service is usually my bugbear in South African fine dining establishments – remember my review of Roots? ), the setting was lovely and the food was faultless. If you are looking for an unfussy, huge plate of rib-sticking food, you are probably better off going elsewhere but if, like me, you are partial to smaller portions, beautiful plating and interesting flavour combinations in an attractive setting, you will struggle to find better than La Colombe. Mmm it all looks wonderful – oh for a few pounds to visit it with! The supermarket prices have escalated hugely since we moved here 8 years ago. It’s usually blamed on fuel prices. Perhaps the difference in the ratio of restaurant prices vs. supermarket prices is that in restaurants a fair amount of the costs are for labour – kitchen staff and service etc. and those things are still much cheaper than in the UK. Just a theory thought up on the spot, may not be the case. I’ve always wanted to visit South Africa. We have some friends in Johannesburg, and we’re thinking that next winter might just be the time. I’ve bookmarked this restaurant in case we go. THANKS! The rising costs of local produce is largely due to rising costs of exports and shipping. In other words, the locals are paying to have (higher quality) produce shipped overseas! This is something that I also noticed when returned to SA. Something else you’ll notice is the difference in quality of South African produce available in SA and abroad, sadly our good stuff goes overseas! 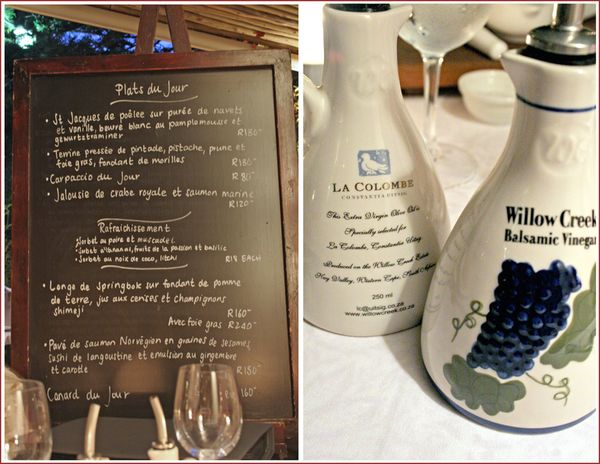 I visited La Colombe a few years back – it is AMAZING, everything was AMAZING! The only comparison I have in John George in New York City, which was nearly as good but twice as expensive! Good to be home, isn’t it? Have a great time at the convention. I’ll join you next year. This looks amazing: I’m definitely going to go next time I’m home: I just wish I had a trip planned already! I would have been happy with the salad of prawns and the dessert and mignardises at the end of course! Your 2 opening sentences are so very true! I’m so jealous that you are in Africa!! I got back in February and immediately wondered why I had done so. But the weather is improving so I shall not complain. I was also really shocked by the incredibly high food prices in SA. Normally we eat HIGH end beef everyday while there (or just about! ), but it was so expensive. No theories as to why the restaurant food isn’t (your meal looks stunning) – will have to give it a think. Great tip for next time I am in Cape Town – I agree that living away from your home town gives you a new perspective. I really appreciated the dining in Melbourne when I was back there last month, even though I love the dining scene in London as well. What beautiful photos and what beautifu food. I love the idea of Sundays in South Africa… I have so many travel moments like this that I didn’t have time to pose while away, this is the perfect way to do it. Maybe I will do Travelling Tuesdays. The desserts looked spectacular. So did everything else – but my frame of reference for the dessert flavours was more present. Heavenly eating!! Wish I could be there now…the change over in seasons are always spectacular, especially in dear old Cape.. I dream about eating there, my bank manager is still in a meeting so it’ll have to wait. I enjoy your pictures until then. Wow, those are wonderful pictures, and it appears that you had a pleasant experience on this portion of the journey back home! It’s fantastic to see a South African restaurant serving such excellent food and making it in the world’s top 50 list. But I do question the list though. As usual it is highly subjective and in order to qualify the restaurant has to serve ridiculously expensive, poncy food. Surely, in some cases basic (cheaper) fare is just as good and satisfying than the posh stuff?